In The Magnetic Fields (Les Champs Magnétiques), a collaboration with Soupault, he put the principle of automatic writing into practice. He published the Surrealist Manifesto in 1924, and was editor of La Révolution surréaliste from 1924. A group coalesced around him — Philippe Soupault, Louis Aragon, Paul Éluard, René Crevel, Michel Leiris, Benjamin Péret, Antonin Artaud, and Robert Desnos. Anxious to combine the themes of personal transformation found in the works of Arthur Rimbaud with the politics of Karl Marx, Breton joined the French Communist Party in 1927, from which he was expelled in 1933. During this time, he survived mostly off the sale of paintings from his art gallery. Under Breton's direction, Surrealism became a European movement that influenced all domains of art, and called into question the origin of human understanding and human perceptions of things and events. In 1935, there was a conflict between Breton and Ilya Ehrenburg during the first "International Congress of Writers for the Defense of Culture" which opened in Paris in June. Breton, had been insulted by Ehrenburg—along with all fellow surrealists—in a pamphlet which said, among other things, that surrealists were "pederasts". Breton slapped Ehrenburg several times on the street, which led to surrealists being expelled from the Congress. Crevel, who according to Salvador Dalí, was "the only serious communist among surrealists" was isolated from Breton and other surrealists, who were unhappy with Crevel because of his homosexuality and upset with communists as a whole. In 1938 Breton accepted a cultural commission from the French government to travel to Mexico. After a conference held at the National Autonomous University of Mexico about surrealism, Breton stated after getting lost in Mexico City (as no one was waiting for him at the airport) "I don't know why I came here. Mexico is the most surrealist country in the world". However, visiting Mexico provided the opportunity to meet Trotsky. Breton and other surrealists sought refuge via a long boat ride from Patzcuaro to the town of Erongaricuaro. Diego Rivera and Frida Kahlo were among the visitors to the hidden community of intellectuals and artists. Together, Breton and Trotsky wrote a manifesto Pour un art révolutionnaire indépendent (published under the names of Breton and Diego Rivera) calling for a "complete freedom of art", which was becoming increasingly difficult in the world situation of the time. In 1939 Breton collaborated with artist Wifredo Lam on the publication of Breton's poem "Fata Morgana", which was illustrated by Lam. Breton was again in the medical corps of the French Army at the start of World War II. The Vichy government banned his writings as "the very negation of the national revolution" and Breton and escaped with the help of the American Varian Fry to the United States and the Caribbean in 1941. Breton learned to know Martinican writer Aimé Césaire, and later penned the introduction to the 1947 edition of Césaire's Cahier d'un retour au pays natal. During his exile in New York City he met Elisa, the Chilean woman who would become his third wife. In 1944, he and Elisa traveled to the Gaspé Peninsula in Québec, Canada, where he wrote Arcane 17, a book which expresses his fears of World War II, describes the marvels of the Rocher Percé and the northeastern end of North America, and celebrates his newly found love with Elisa. Breton returned to Paris in 1946, where he intervened against French colonialism (for example as a signatory of the Manifesto of the 121 against the Algerian war) and continued, until his death, to foster a second group of surrealists in the form of expositions or reviews (La Brèche, 1961-1965). 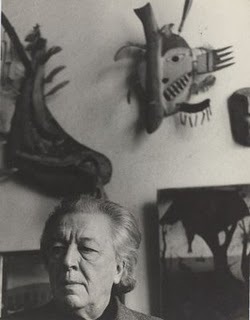 In 1959, André Breton organized an exhibit in Paris. André Breton died in 1966 at 70 and was buried in the Cimetière des Batignolles in Paris. * His first wife, from 1921 to 1931, was Simone Collinet, the former Simone Kahn (1897-1980). * His second wife was the former Jacqueline Lamba, with whom he had his only child, a daughter named Aube. * His third wife was the former Elisa Claro. His works include the case studies Nadja (1928) and Mad Love (L'Amour fou) (1937). Breton was an avid collector of art, ethnographic material, and unusual trinkets. He was particularly interested in materials from the northwest coast of North America. When faced with a financial crisis in 1931, most of his collection (along with his friend Paul Éluard's) was auctioned off. He subsequently rebuilt the collection, which was preserved by family members from the time of his death until 2003, at which time his books, art, and ethnographic materials were auctioned by Calmels Cohen. Nine previously unseen manuscripts, including the Manifeste du surréalisme, were auctioned by Sotheby’s in May 2008.